There were three IAPBT conferences held in Japan in the past: Tokyo Conference (1983), Kyoto Conference (1989), and Hamamatsu conference (1999). At the next conference in Hamamatsu, we hope to be able to exchange our knowledge and information on piano and piano tuning, and also to build our friendship. We wish to have as many participants as possible from your country, and to be able to have a meaningful time together. For further inquiries, please contact us in the International Division of JPTA info@iapta.org. We are looking forward to seeing you in Japan in 2019. 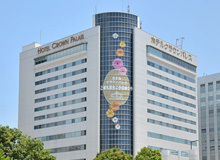 Hotel Crown Palais is located 3 minutes walk from JR Hamamatsu Station with exquisite appearance. Excellent atmosphere and high-quality hospitality & service will ensure guests' refreshment and relaxation.